In an ideal, time-travel enabled universe, we’d have tweeted to Bram Stoker, who would have sent us a pair, but, no Twitter, no time travel, and Bram had been dead for 80 years. However, months after our failed toy shop recce, one lovely man, at a toyshop called Shevik’s, remembered the siblings who wanted fangs. We had left our address. He took the trouble to post us a pair when he received the order he must have placed for them. And so, one afternoon, in Babina — an army cantonment in Madhya Pradesh — we received a parcel of white rubber fangs. We were so excited, us brats in grade 6 and 7. How much we wore those fangs! How we showed off in class! My fangs story has little bearing on the much-more-relevant story of Kulsum Bano, the student of Haji Public School, Doda district, Breswana, Jammu & Kashmir, who last week received a parcel from author JK Rowling. As I watched videos of Kulsum shyly opening her package, I was reminded tangentially of receiving those glorious fangs, red splotches on the molars and all. Rowling, tagged in that tweet, replied (replied!) to Haji saying she would like to send something for Kulsum. This was, remember, in end April. Rowling’s team had obviously reacted fast enough, because a heavy, books-filled package arrived in Doda soon enough, on May 7. Why that parcel took six weeks to get from bottom of the hill to the school at the top of a hill is material for a short story, one in which the post master comes off looking not quite like the dream employee. The parcel finally arrived at the school premises on June 23. It was a heavy box and it was ferried on a khacchar (mule) from the post office down the hill. I didn’t make up the khacchar part. Or the fact that Kulsum’s classmates now address her as “Rowling”. Haji told Khaleej Times as much. She also said that the parcel had been sitting in the post office since May 7! Haji, who grew up in Dubai, says the one positive outcome for the school is that “it lends credibility to the school, and we show up better in SEOs”. 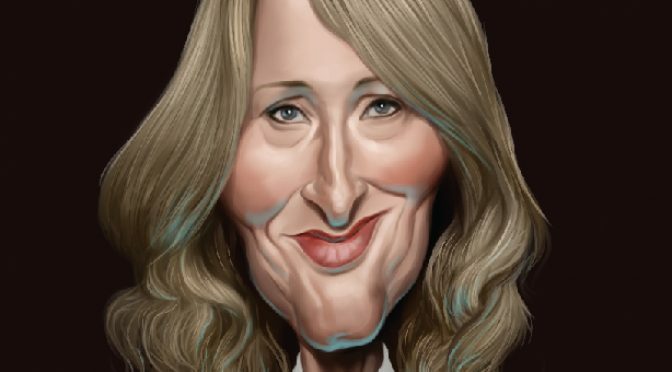 That JK Rowling is a rockstar is well-documented. For her writing, in any case — for delivering us the boy wizard and his spells and his pals; “Hermaaaaine not Hermeeeoni”, one of the teachers corrects a student in the video. But Rowling could be loved even more for the impact of her humanitarian work. The website of her organisation Lumos has the tag line, ‘Children belong in families, not orphanages’. She’s been vocal about Trump’s policies, most recently, his agenda to tear kids away from their mums and dads and place them in cages. Is a child who gains a love of reading and the power of the imagination and sweet Ron Weasley from her books any less in her debt than an orphan given a shot at a better life? Probably, yes. My uninformed guess is only that a roof over your head, stability, and family close to you any day trumps a (however valuable) love for words, books, Hermione, and those wizards. It’s such a decent thing for Rowling to do, to make good on a wish to send Kulsum something, especially when it sometimes feels like we’re drowning in bleakness. That she sent a girl in a school in the Himalayas, far away from her environment, this thoughtful package of books and pens, handwritten notes, and didn’t forget the school teachers, is an act of great compassion and kindness and rightfully lauded.